Lately I’ve been giving a lot of thought to toxic people and how we all deal with them. When I was younger, I think I definitely put up with a lot more toxic behavior than I would nowadays. Labeling someone as “toxic” doesn’t necessarily mean they are emotionally abusive, but they do typically judge others, spread negativity, and have a gift for making you feel the exact same way after being in their presence. A simple phone call or chat with them can leave you feeling heavy-hearted, stressed out, or in a foul mood. Who wants to feel like that?! I used to allow the toxic people in my life to drain my energy & positive attitude and affect my mood for the remainder of the day. Sometimes associating with them even turned me into the toxic person. Whether it was a co-worker, a friend, or even a family member, there are several instances now when I look back that I should have been more proactive in limiting my contact with those people. I would have been much happier at the time as a result. At this stage of my life, I’m extremely protective of my inner peace and will fight like hell if someone is trying to ruin that for me. Some may view that as selfish behavior, but I think that sometimes you deserve to be selfish and guarded about how you let others affect you. The way I see it, if someone or something takes away from your ability to feel happy and peaceful, they need to be either dealt with or removed from your life. This is the first and most important step! Take some time to reflect on your interactions with everyone in your life and how you feel after talking to certain individuals. Do you find yourself in a bad mood or having a negative disposition towards life in general after every time you speak to someone? Evaluate your relationships and see which ones are having positive or negative impacts on your happiness and well-being. When you find yourself getting sucked into a conversation that is revolving on complaints and breeding negativity, you need to tune those complaints out. Whether it’s changing the topic of the conversation, or even finding an excuse to physically leave the conversation, nothing good can come of listening to incessant complaining or negative remarks. If you really want to send them for a loop, go beyond just tuning out their complaints and instead drown them with positive remarks. Toxic people don’t usually take well to the conversation being abruptly changed to something positive. Find a way to put a positive spin on their negative remark and send the conversation spiraling to a happy place. If they are looking for someone to unload their negative energy onto in the future, they likely won’t be coming to you again! Hang out in groups if at all possible. For example – if it’s a co-worker who has toxic energy and you find yourself being forced into social situations with this person, try to include others if at all possible. This way you are not the only one on the receiving end of the negativity and there are others to help you absorb the negative comments and try to put a positive spin on the conversation. Toxic people are generally toxic to everyone around them, not just you. Don’t take their behavior personally or as a direct reflection of you. They tend to not think very highly of themselves, and are displacing that negativity onto others as a way to cope. Their behavior has everything to do with them and nothing to do with you. Perhaps this is someone who you’ve been friends with since grade school or is even your spouse. It can be hard to accept that their toxic behavior is impacting you in a negative way, but dealing with it is something that you need to make a priority. 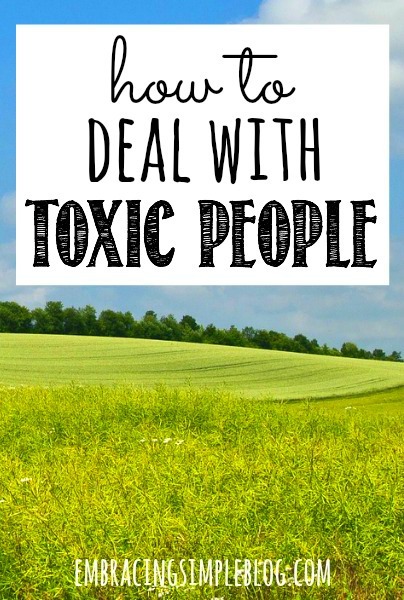 This is by far the easiest way to combat toxic people in your life! 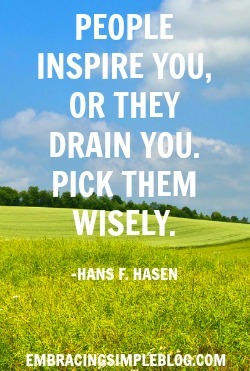 Fill your life up with positive people who radiate good energy and encourage you to be the best “you” that you can be. These are the people that build you up and have faith in your ability to do whatever you set your mind to. They don’t judge you for being who you are, and are supportive and genuinely happy for you when you succeed. This proves to be much more difficult if they are co-workers or close family, but try to at least drastically decrease the amount of time you spend with them. If someone is affecting the way you view yourself or the world around you in a negative light and is preventing you from being the absolute best person you can be, there is absolutely no reason why that person should still be in your life. I understand that sometimes this can be a parent or perhaps even your own child you are dealing with, which would make this whole process significantly more difficult to get through. If this person is in your closest inner circle, I would definitely suggest sitting down and having a conversation with them about how their behavior has had a direct impact on you in a negative way, and that things need to change. You might be presenting a great opportunity for them to reevaluate their disposition towards life and help them turn their attitude around for the better. Have you ever had to deal with someone who was toxic to your happiness? Do you have any tips to share that helped you in that situation? Good suggestions especially talking positive and never being alone with them. Also, I ask God to help me view this person as one of His beloved children. So true, Rebecca! A negative leaving does tend to open up more room for the positives 🙂 Thanks for sharing!! I agree SO MUCH with this. Cutting the toxic people out of your life is so essential to emotional well-being. There definitely comes a point in your interactions with someone where their presence in your life is no longer beneficial, educational, or healthy. When I reach that point with someone, family or friend, I’m just done. I have too much respect for myself to let others’ negativity bring me down. 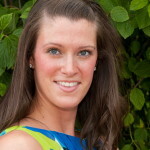 Great post Christina and very timely! I am in the process of dealing with a toxic relationship at work. I had started letting it influence my perception of myself. This helped me remember that his reaction to me has a lot more to do with his low self-esteem than it does with me. Thanks for helping remind me of healthy ways to deal with the issue. I need to remember I can’t control the emotions or reactions of others! Thank you Lora!! I’m so glad you found this helpful – and very true. You cannot control his actions! Best of luck in dealing with this situation, I know how tough it can be. Hang in there! Such good advice! I used to think, “If you’re kind and considerate with other people, they’ll be kind and considerate with you.” But that is not always the case. I like the advice, “Have some self-respect.” I think that toxic people have the ability to sniff out a lack of confidence. Once you assert that confidence, they tend to skulk away. Very true Ruth, it’s sad that that’s not always the case. And toxic people tend to really dislike confidence hah they do sniff out lack of it! And they really don’t like it when you develop confidence during your friendship too haha 🙂 Unfortunately for them we can’t sacrifice our happiness and success so they can feel bigger and better! I used to have a co-worker who was also my best friend. We would get all ready for lunch. I loved this girl. She was like you, Christina, so happy and positive. She could make you feel good about falling in a sewer. But anyway, we’d get ready to go to lunch, and this other girl would slide in the office right when we’d be leaving and invite herself to lunch with us. It was like being slapped with a giant wet blanket. She was SO negative. No matter how positive things were, she would always find something negative to say about it. I wish we’d have been gutsier and just told her we just wanted to go to lunch alone! Whenever we’d go alone, the food tasted better and digested so much easier. Aw thanks Kay! I actually know exactly what that’s like in an office environment…I dealt with an extremely similar situation. Funny how food tastes better when you are truly enjoying the company you are eating it with! Love the way you think Christina, I’ve been cutting toxic people out of my life for the last year or so and now I can see how much it effected me. This is a great list. I’ve intentionally spent less time with “toxic” people and it’s gone one of two ways. They either slowly fall out of my life or they start being more positive when I’m around them because they realize the lack of time I spend with them is intentional. Either way you can’t go wrong with de-prioritizing the relationship. I’d like to add one recommendation to your list, though it only applies to toxic people you really love. Maybe that’s a family member or maybe it’s a dear friend who has been through bad things, making them a downer to be around. I’d suggest having good ole heart-to-heart with them. Maybe they don’t even realize what they are doing or to what extent. Ask questions, don’t just accuse. Point out how their behavior has affected people around them. Warn them that they will drive away people of they behavior continues. Love them, help them. I definitely agree with that Kirsten! Especially when it comes to family or close friends, it’s worth it to have that conversation and try to fix the situation instead of just throwing the relationship out the door. I think this is great advice! I also think we should take some time and evaluate ourselves, because we could be a toxic person without knowing it or meaning to be. So true Tennille! I know that I’ve been a toxic person myself in a few situations, no one is immune from it! Absolutely Lisa! Oh no, I’m sorry to hear that!! I’ve learned how to distance myself from toxic people after realising that, often, they probably don’t even have the intention to change or make their situation better. I’m a fairly positive person and I always try to find the good in everything but there was a time when I was constantly lending an ear to friend who was/is going through a difficult time and I found that instead of influencing her to be positive, she actually transferred some of her negativity to me. It was then that I realised I needed to take a break from her. It was a hard decision to make because I know she needed a friend but I had to do it to keep my own sanity. This was an enjoyable read. Thanks for sharing! That’s always a tough call to make when it comes to good friends, but transferring negative energy can be so detrimental to you too! Sounds like you made the right decision. I love your thoughts on this topic! I have some family that are toxic and I was allowing their attitudes and gossip to bring me down and think badly about others. It took me a few years to realize that, but now my husband and I have greatly distanced ourselves from them. We have learned that we just have to change the subject and be as positive as we can be around them! That’s always tough when you have to distance yourself from family, but it sounds like it has mad a positive impact on your and your hubby. Sometimes you just need to make that tough decision to spend less time with toxic people or their mentality ends up having a neggative effect on you too! This was a great read. I have some in-laws who are very toxic, but actually at first I really enjoyed hanging out with them. When they were good they were good! A lot of fun, but the hate they had for other family members and even the way they treated strangers was enough to overshadow their good qualities. I was starting to act like them until my husband pointed it out to me. I had a falling out with them and we didn’t speak for over a month. Now we remain civil. We see each other at holidays and we small talk. Part of me is sad because I miss the fun we had, but the bad was just to much. I can see the difference in my behavior and how I feel, so I know I made the right choice. I’m in the almost exact situation as Erica. It’s only my mother-in-law. She doesn’t realize how negative she is or how she affects other people. I had a falling out with her and she really has it out for me now. I wasn’t trying to hurt her, I just wanted her to know how I had been feeling. Her negative ways really impact my children and I can’t subject them to that anymore. My husband and I are distancing ourselves from her and hopefully she will come around and at the least be civil someday. That’s so tough Tanya, but sounds like it was necessary to protect your family from the negativity. Hopefully she will see how her attitude was impacting you all in such a negative way and she will be able to be more positive in the future! Sorry you are dealing with that! Great Post, Christina! Tina from Boomerina’s pinned it and here I am. I must be a TOXIC person magnet because I’ve had my fair share. It has been my experience that you just have to cut them off completely because if you give these people an inch, they’ll take a mile. I cut off an old roommate, and on again off again on again beau, Best Friend from College and drumroll please . . . my father. Aw that’s fantastic Karen, so glad you found me! Wow that sounds like a lot of toxic energy to be dealing with. I can’t even imagine having to cut off a parent or how difficult that must have been, but I give you so much credit for knowing what was best for yourself and sticking to your guns. So many of us can learn from your strength and ruthlessness. Thank you for sharing!! What if this person is your mother? Or your husband? Helpful ideas ! Thanks for sharing. I wish I could avoid negative people from my circles.. Thanks Kamar, glad you found them helpful!